SpiceJet is an Indian low-cost airline headquartered in Gurgaon, India. It is the country's fourth largest airline by number of passenger carried with market share of 12.3% as of July 2015. The airline operates more than 270 daily flights to 41 destinations, including 34 Indian and 7 international cities. The origins of SpiceJet track back to February 1993 when ModiLuft was launched by Indian industrialist S K Modi, in technical partnership with the German flag carrier Lufthansa. The airline ceased operations in 1996.In 2004, raised funds and restarted operations as SpiceJet following the low-cost model. SpiceJet leased 3 Boeing 737-800 aircraft. On 7 March 2005, the Airports Authority of India approved three overnight parking slots to SpiceJet, with two in Delhi and one in Mumbai. SpiceJet opened bookings on 18 May 2005. The first flight was flagged off by then Union Minister of Civil Aviation, Praful Patel. The first Boeing 737-800 aircraft left Indira Gandhi International Airport, New Delhi for Chhatrapati Shivaji International Airport, Mumbai on 24 May 2005. By 2008, it was India's second-largest low-cost carrier in terms of market share. Indian media baron Kalanidhi Maran acquired 37.7% stake in Spicejet in June 2010. In 2012, SpiceJet suffered from a loss of over ₹390 million (US$5.9 million) owing to increase in global crude prices. On 9 January 2012, the Directorate General of Civil Aviation, reported that several airlines in India, including SpiceJet, have not maintained crucial data for the flight operations quality assurance or the FOQA. 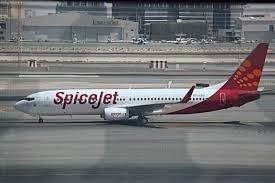 The Bombay stock exchange announced that ever since June 2011, Spicejet had been suffering losses. In 2012, Despite the losses, Kalanithi Maran increased his stake in Spicejet by investing ₹1 billion (US$15 million) in the airline. The airline returned to making profits at the end of the year. In 2013, SpiceJet launched its first interline pact with Tigerair on 16 December 2013.